Episode 78 - Elizabeth Behrens. Dan Sterenchuk and Tommy Estlund are honored to have as our guest, Elizabeth Behrens. Elizabeth Behrens's days are more than full, but that's exactly what she loves. Originally from Iowa, she now lives in Kansas City with her husband and four children. 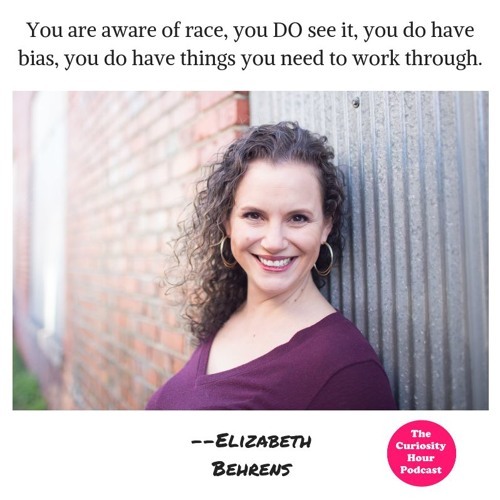 She has a job she loves as Ambassador and engagement Coordinator for Be the Bridge, a non-profit organization founded by Latasha Morrison, that is equipping people to work toward racial reconciliation. Her work with Be the Bridge allows her to teach online classes, tell the stories of how people's churches, schools, and communities are changing, and interact with a group of over 20,000 fellow bridge builders in the organization's Facebook group. She also volunteers as a CASA (court appointed special advocate) for children in foster care. When she isn't busy with work and volunteering, she can be found being rejuvenated by reading, gardening, or if she's lucky, traveling. You can find out more about Be the Bridge at www.bethebridge.com and www.facebook.com/groups/bethebridge. Note: Guests create their own bio description for each episode. The Curiosity Hour Podcast is hosted and produced by Dan Sterenchuk and Tommy Estlund. Please visit our website for more information: thecuriosityhourpodcast.com Please visit this page for information where you can listen to our podcast: thecuriosityhourpodcast.com/listen/ If you would like to share your story or have a suggested guest, please complete the "Contact us" form: thecuriosityhourpodcast.com/contact-us/ Disclaimers: The Curiosity Hour Podcast may contain content not suitable for all audiences. Listener discretion advised. The views and opinions expressed by the guests on this podcast are solely those of the guest(s). These views and opinions do not necessarily represent those of The Curiosity Hour Podcast. This podcast may contain explicit language.